Even though 30-year mortgage rates are still historically low, you'll probably have a few more years to take advantage. While 30-year mortgage rates are not quite as low as they were during the first half of 2013, the current average rate of 4.14% is still very low on a historic level. 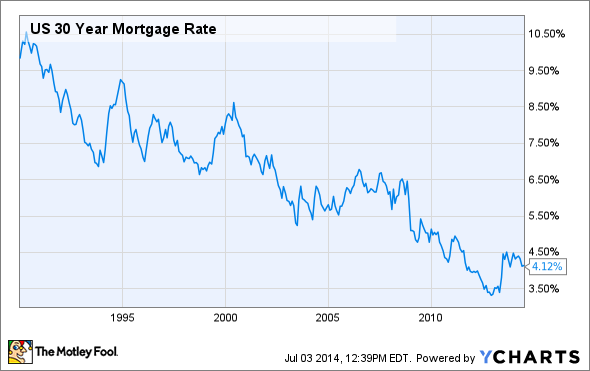 In fact, before the mortgage crisis hit, we had never seen rates this low. Despite the attractive rates, you don't need to be in too much of a rush to buy right now. Despite what some of the recent news headlines might have you believe, I don't think the low rates are going anywhere anytime soon. Here are three reasons why I think you'll be able to take your time getting ready to buy a home. The Federal Reserve is scared to death of disrupting the fragile economic recovery, so it is likely to err on the side of caution when it comes to raising rates. Interest rate hikes could still be a few years away. The current inflation rate is getting close to the Fed's target rate of 2%, and the unemployment rate is at 6.1% -- just above where the Fed wants it. But there is still some economic data that is too weak for comfort. 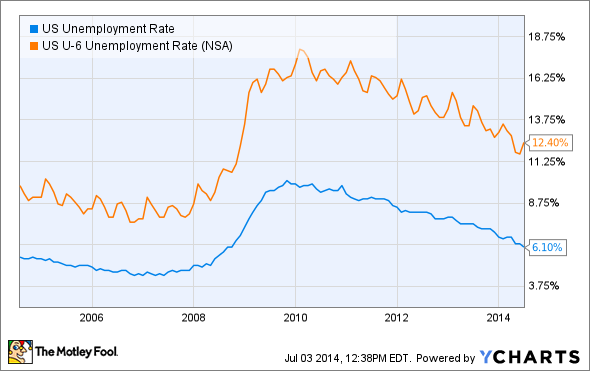 As far as unemployment is concerned, that 6.1% figure doesn't really tell the whole story. The "U-6" rate, which includes the unemployed, underemployed, and those who have given up looking for a job but are able to work, is still at an alarmingly high 12.4%. While this is a nice improvement from the 18% level we were seeing in 2010, it's still too high to be considered "healthy." Even at the peak of unemployment resulting from the early 2000's recession, the U-6 number barely touched 11%. A level of below 9% is more typical of healthy times. Plus, the spread between the two unemployment rates is much higher than it had been before the recession, indicating a much higher rate of underemployed and discouraged workers. It doesn't really do the economy any good to have people working in jobs well below their skill levels, and it doesn't help to simply not count those who have given up. You can bet the Fed is aware of these facts and will consider them in its decisions. Don't buy when everyone else is! Even though rates are low, the summer is not an optimal time to be house hunting. The summer season is the peak of "selling season" for much of the U.S., and according to Realtor.com, about 50% of home sales take place during the summer months. Kids are off from school, the weather is conducive to moving, and buyers may be under pressure to find a new home quickly. As a result, sellers tend to expect more during the summer. You'll find that with more traffic through the door, summer sellers are much less flexible on price, and the good deals tend to get scooped up quicker. On the contrary, waiting until it gets cold again might be a better idea. While it may sound inconvenient to go house-hunting in freezing temperatures, sellers who put their homes on the market in the winter could be in more of a hurry to move and most likely have fewer prospective buyers. As a result, there are generally better deals to be had. 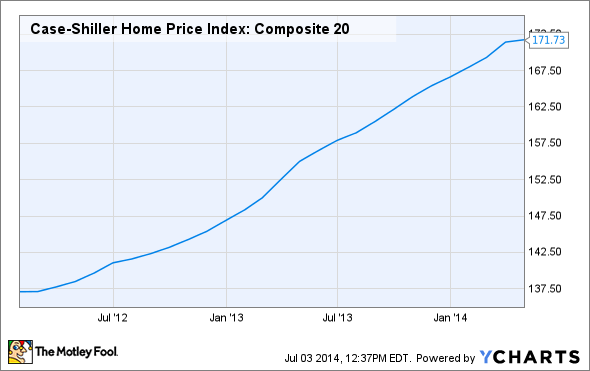 Home prices have risen fast over the past couple of years. Regardless of the 30-year mortgage rates, an expensive house is an expensive house. The average U.S. home value has risen by about 27% since the beginning of 2012, and there is evidence that the market may have come too far, too fast. Home sales looked good in May thanks to a buildup of demand over the colder-than-normal winter, but not all of the data looks great. Even with the 6.1% gain in May, pending home sales are down more than 5% from the same time last year. One of the best indicators of the near future in housing is mortgage applications, which have dropped in five of the last six weeks. When buying a home, you generally apply for a mortgage shortly before getting serious about buying, so this could indicate the typically busy summer season might be slower than expected, which could lead to an excess of inventory (and lower prices) later on. The point here is not to discourage you from buying a home if you're ready, but to discourage you from "jumping the gun" and buying a house quickly simply because 30-year mortgage rates are low. You probably still have at least a couple of years to take advantage of low rates, and if the recent mediocre housing data is any indicator, home prices may even ease up a bit. Whatever happens, a house is a serious, life-changing purchase, and mortgage rates shouldn't prompt you to buy your next home sooner than you'd like. Take your time now, and you'll be glad you did later.